Cancer has taken so much from me, and on many occasions I couldn’t see what the ‘new me’ could give to the world. Lacking so many of the ‘ingredients’ that made up the ‘old me,’ I struggled to find any enthusiasm to carry on. But now I find myself at the centre of the incredible changes that are happening in the cancer world. Patients are finding their voice and finally healthcare is listening. This is not just in the UK but across the world. Innovation is happening quickly and it seems like the clunky corporates are being replaced with caring community organisations, as it is finally seen that a large one size fits all approach is no longer appropriate. I have just returned from a trip to Palestine and Jerusalem, at the invitation of a Palestinian charity. I was asked to speak at hospitals, universities and local chamber of commerce venues. The trip created so much interest, and the time flashed past as we travelled to meet businessmen, patients and support groups, keen to learn more about simPal and Chris’s Cancer Community. The area is totally unique with it’s political challenges, but I asked everyone to ‘leave politics at the door’ when discussing healthcare. In many ways these people are more advanced than we are, as it was great to see local business also understanding they had a major part to play, Not only financial but also in helping raise awareness. Our meetings always contained patients, business, charity and healthcare. My style of speaking created many discussion points, with people talking openly which apparently rarely happens, due in many cases to the unique cultural challenges. 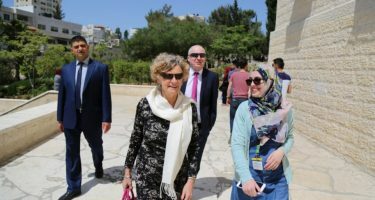 I felt very honoured to be invited to stimulate these conversations, and I think the highlight for me was going to a support group in Hebron. The facilities were very sparse, but as always, it is about the community created. Here the ladies had formed a fabulous bond. But something incredible happened. A man who we had been speaking to the day before, also came along to the group for the very first time, to see what it was all about! The trip was intense, physically and emotionally demanding, but Mrs L was able to come along and support me. In several presentations her role as a carer was explored, and made a great impact on the audiences. Sue was blown away too, although slightly anxious when she was invited to the stage unexpectedly! We met many wonderfully generous people who wanted to share and learn. I could really sense the desire for improvement and would like to think that this might be the start of some wonderful working relationships. But we live in incredibly transient times, which seem to be dominated by politics, whether we like it or not. It is difficult to make long term plans, with life constantly changing. During my visit I saw some of the best and worst of what politics can offer us. Mostly I was made extremely welcome everywhere I went, and I was introduced to some of the most influential people in the area. When speaking in Hebron I was invited to talk at the Chamber Of Commerce, and whilst in Jerusalem the British Consulate-General attended my talk. All of us looking to create longer term working relationships. However whilst waiting for our plane back to London in Tel Aviv airport I was pulled aside by airport security, who wanted to know my life history and what was the purpose of my visit. This left me with a scar, not because of the interrogation but the total lack of understanding regarding humanitarian issues. Of course this has given me a stronger determination to go back and continue what we have started! I guess we need politics, to keep the world running, but I find it a massive barrier to progress in healthcare. Trying to make some very simple changes in a system can take forever. From my experience, much of the change required is inexpensive, but nobody seems to want to listen. These issues are common across the world, whatever cancer type you are. The fact that I am totally independent, with no agenda other than to help people affected by cancer, has opened many doors around the world, and I am in a totally unique position, being still a long term patient too! In my life after cancer every day is a joy, even the bad ones! What I do will never make me financially rich, but certainly makes up for that in terms of satisfaction. Just by sharing my own experiences I can make people smile, that is an incredible feeling! The smile is a universal currency which is understood by everyone in the world. I would like to end this piece by thanking the incredible Carol Jabari from Patient Friends Society charity for reaching out, and sharing her life with us for a few days, and we hope that we can continue the wonderful things we have started. Having finally had the time to reflect on our visit, I have just received an invitation to speak at the World Cancer Congress in Kuala Lumpur. The story continues…………. "Is My Work Still Relevant?" Does The Cancer World NEED The 'Fear Factor' For Income? Thx so much Deb. I can see from every presentation that I do, I can make people smile. But more importantly people take hope from hearing my story. In the area I was working, the traditional view still is that if you have cancer, it is a death sentence. So hen all the people came to meet me it produced many smiles.